Cassia Pappas has found herself in a nearly impossible situation. 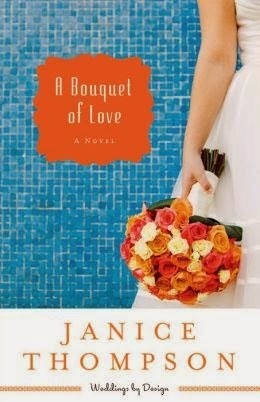 She wants to spend her time immersed in her new job at a Galveston Island floral shop, arranging blooms and brightening occasions with her lovely creations. But her huge Greek family--especially her father--has other ideas. They've all relocated to Galveston to open up a new family restaurant location on the Strand--directly across the street from the Rossi's popular pizza place--and they want Cassia's full participation. Hooked sums it up nicely. I was hooked on the other books in this series and this one wasn't any different. Poor Cassia! She really found herself in quite a pickle more than once. This is one of those great books where you'll laugh, you'll groan and you'll be thrilled to catch up with some of the characters that you met in other books. Every time Cassia's father came up with a new idea, I chuckled and wondered how I'd do in a family like theirs. It was full of love, but also had a uniqueness that no other family could compete with. If Janice Thompson ever wants to go back to Galveston, I'll be along for the ride.